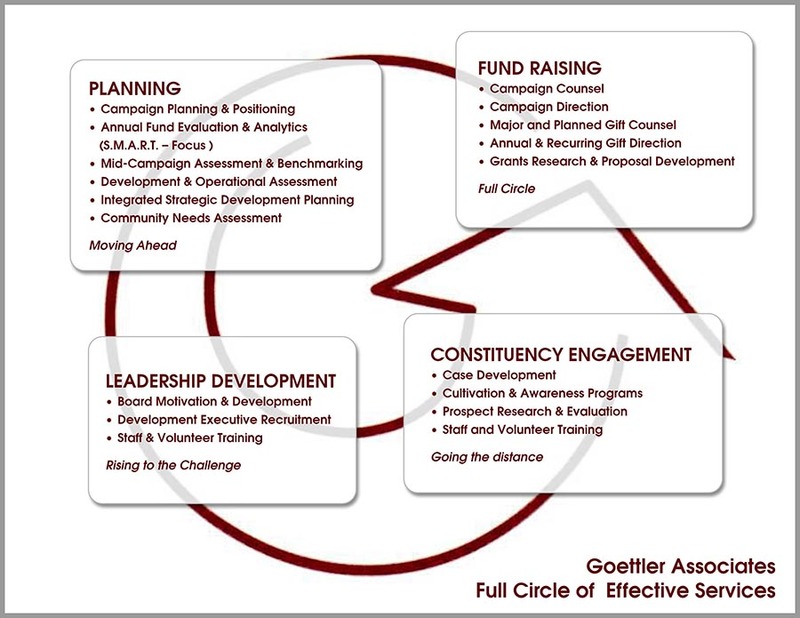 Goettler Associates’ fundraising consulting services can elevate your organization’s Fundraising to its maximum potential through a Full Circle of development programs and appeals. Goettler Associates is equipped to provide a wide-range of campaign counseling services to devise a successful strategy and establish a solid campaign structure to implement a comprehensive plan of campaign that defines goals, time lines, and shared tasks. We will monitor campaign activity against these milestones and work in-partnership with client staff and volunteers to realize the organization’s full fund-raising potential. Our campaign directors have a demonstrated track record of success, and will provide the expert guidance and direction to your organization=s staff and volunteers required to realize your stated goals. Our campaign direction service provides more intensive on-site work to carefully guide and direct your campaign to success. As organizations have grown and increased their internal resources, they have expanded their capacity to maintain multiple development programs and appeals. Focused major and planned gift appeal programs can and must be initiated outside of major gift (a.k.a. capital) campaigns. Fund-Raising Counsel will guide the strategic implementation of strategies to evaluate, identify, cultivate, and solicit transformational gifts. Goettler Associates provides expert major and planned gift counsel, including organizational readiness assessments; board education and participation seminars; gift planning; planned gift training for staff and volunteers; development of gift-making policies and procedures; and technical support and guidance. Careful research supports our services to guidance your creation of sustainable programs for retaining individual, corporate, and foundation funding. We will work with client institutions to create a measurable donor continuum that leads to highly effective and efficient recurring gift programs. Goettler Associate’s teams of professionals have developed expert grant writing skills and a track record of success. Our typical approach is to first develop the resources required to complete common grant applications so that existing client personnel can replicate future efforts. We will also conduct searches of public databases to identify public, private, and community-based grant making institutions to construct a matrix of possible funders.